DHL is the leading global logistics firm in the world right now! With over 50 years of experience in the shipping industry, they offer both quality and wisdom when it comes to your packages. An industry leader, delivering products for millions of sellers across the world. DHL has grown to be one of the most dynamic and wide spread shipping industry in the world right now. They ship to over 220 countries in the world and have state of the art technology to delivery your order. 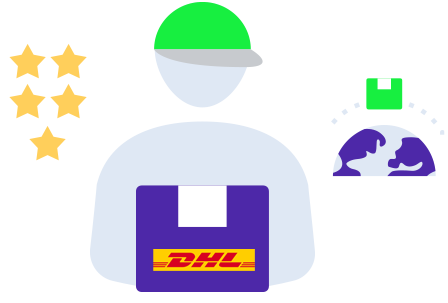 With Shiprocket, you get to ship your international orders with DHL eCommerce, DHL express, and also other renowned courier companies like FedEx and Aramex. With a few clicks, you can ship to over 220 countries in India and over 26000 pin codes abroad. If you sell on global marketplaces such as Amazon US/UK and eBay US/UK, you can integrate your marketplace with Shiprocket and fetch orders directly. If you’re shipping internationally but have warehouses across India, Shiprocket will pick up orders from all of them. Provide your buyers with sorted tracking information to keep them informed about their orders at all times. We charge no setup fee for Shiprocket. You pay as you go. Sign up and start using Shiprocket today.